There is something magical that happens when you pair black beans along side sweet potatoes. It’s like they are truly meant to go together! 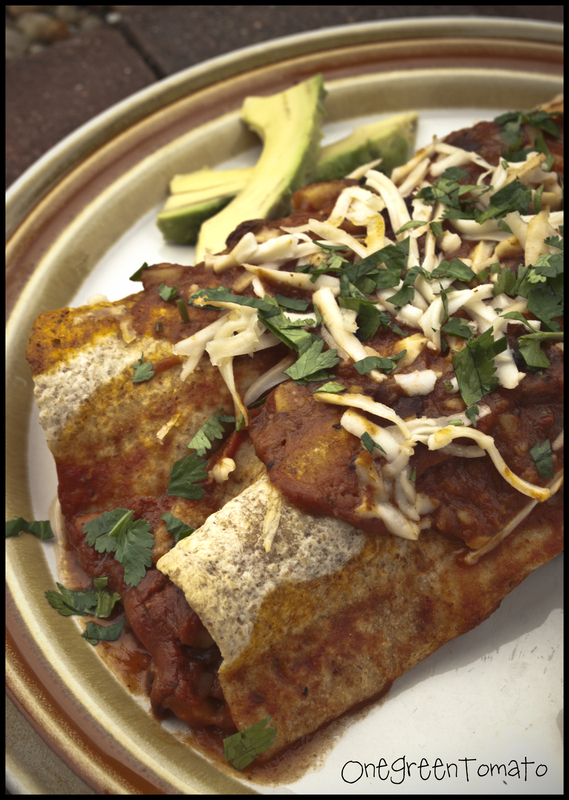 So when the December issue of Vegetarian Times featured a drool-worthy enchilada recipe combining those two ingredients, it jumped to the front of the menu line! Making only minimal changes to incorporate what I had on-hand in my canning pantry, along with a few vegan substitutions, the dish turned out absolutely delicious! Since the recipe can be made the night before, it’s a great go-to potluck dish! And because it makes several servings, it is the perfect take-to-work-lunch. I simply portion out and freeze single servings, then pack my fresh garnish the morning of. To make Sauce: Bring all ingredients to a simmer in a sauce pan over medium heat. Whisk to combine, then remove from heat. Season with salt and pepper to taste. To make Filling: Heat oil in a separate sauce pan over medium heat. Add onion, and sauté for 3-5 minutes, or until soft. Add sweet potatoes, tomatoes, salsa, garlic, chili, and 1/2 cup water; bring to a boil. Reduce heat to medium-low and simmer 30-40 minutes, or until sweet potatoes are soft. Mash mixture with a potato masher until combined. Add black beans, and cook 5 minutes. Stir in half of the cheddar shreds and remove from heat. To assemble Enchiladas: Preheat oven to 350°F. Brush a 9×13-inch baking dish with oil. Spread 1/2 cup of the sauce in bottom of dish. Fill tortillas with filling. Roll and pack close together seam-side down in baking dish. (My baking dish only held 10 enchiladas, so I placed the rest of the filling in a container and ate it as is.) Top with remaining sauce and cheddar shreds. Bake 15 minutes. Adjust oven to broil. Broil enchiladas 5 minutes or until cheddar shreds begin to brown. Let rest 10 minutes before serving. Garnish with lime wedges, avocado slices, sour supreme, and cilantro if desired. Images and content copyright © 2009-2012 Danielle R Limoge. Recipe adapted from Dec 2011 issue of Vegetarian Times.